Almost 90-percent of local searches are done with Google. 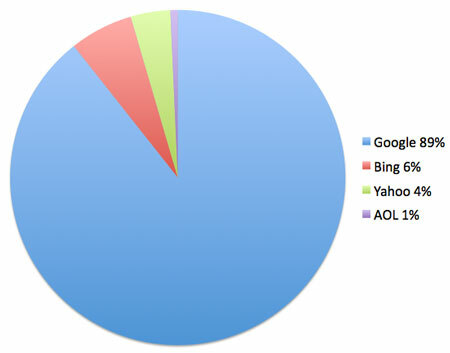 It’s no surprise that Google is the top dog when it comes to online search engines. But while national statistics show Google getting around 66-percent of the search engine market share, locally Google’s stats spike. Nearly 90-percent of local search engine traffic comes from Google, according to an analysis of over 250,000 Internet searches over the past 12 months that brought traffic to the Paso Robles Daily News. “We offer web design, online marketing, and search engine optimization services that help our clients rank higher on results pages,” Brennan says. “We focus our efforts on Google’s search results because it gives our clients the best return on their investment,” he says. 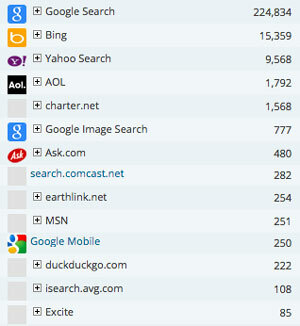 Raw data of 12 months of traffic to the Paso Robles Daily News from top search engines. For more information on web design, online marketing, and search engine optimization services call Access Publishing at (805) 226-5714.